In a new report released this week, credit firm Experian and consultancy Oliver Wyman estimate that about 355,000 homeowners strategically defaulted in the first half of 2009. The Experian-Wyman report, though, also notes that the pace of defaults might have peaked even before the recovery started. 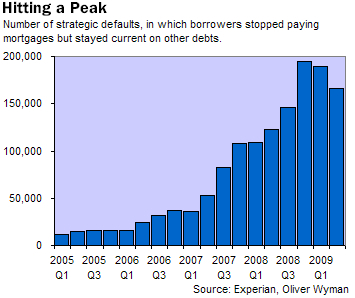 The number of strategic defaults in the second quarter of 2009 was down 15% from the last quarter of 2008. The research defines “strategic defaulters” as homeowners who have remained delinquent for six months after the initial date of delinquency; they have chosen to stop making mortgage payments, even though they can still afford them.